Wymondham, England – Snelling Business Systems, is one of the fastest growing global suppliers of integrated Audio Visual systems in England. Their portfolio covers major global projects for clients around the world. Higher education, corporate, healthcare, public sector, retail and specialist niche projects are just a handful of the spaces you can find Snelling’s work. Frontier, a world leading developer and self-publisher of high quality game franchises contacted Snelling with a need to renovate their facility to not only make more of an impact but also support the creativity and collaboration of its talented staff. 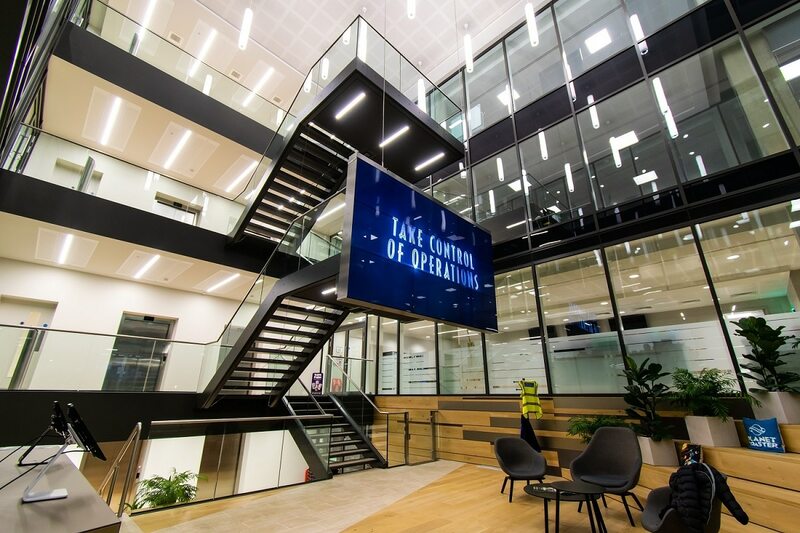 We were very pleased when Snelling reached out to us through our UK partners at Amber Sound with designs for a gorgeous 3X3 suspended LG LCD video wall. Adaptive’s HoverGrid™ system was a perfect fit for the project and the rigged video wall along with the rest of Snelling’s beautiful design was executed without a hitch.